The Big Wobble: A deadly mag 6.7 quake strikes Turkey causing a tsunami along the Turkish coast and Greek islands. A deadly mag 6.7 quake strikes Turkey causing a tsunami along the Turkish coast and Greek islands. At least two people have been killed and more than 100 have been injured after a strong earthquake struck Greek islands and Turkey's Aegean coast early Friday morning, authorities said. 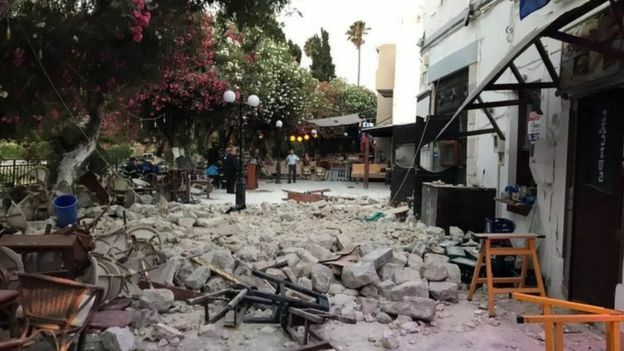 Buildings on the Greek island of Kos sustained structural damage from the earthquake, the city's mayor, Giorgos Kyritsis, told state-run Greek media. "The buildings affected were mostly old and were built before the earthquake building codes were introduced," Kyritsis said. The coast guard announced the island's port was part of the structural damage. Giorgos Halkidios, a government official for the island of Kos, said more than 100 people were injured in the quake. The 6.7-magnitude earthquake was centered six miles south of Bodrum, Turkey, and 10 miles east-northeast of Kos, according to the U.S. Geological Survery. According to Turkish disaster officials, more than 20 aftershocks have been recorded. The BBC reported a small tsunami occurred on the Turkish coast. Last nights quake was the only the 7th of July and only the 54th of 2017 in what is likely to be the lowest yearly amount of major quakes since the 1940's.